The life cycle of rainbow trout is similar to that of brown trout and Chinook salmon. The female digs a redd (nest) and deposits her eggs. The male fertilises them with milt (sperm). Eggs take 20–100 days to hatch, depending on water temperature. Once hatched the alevins (fry with yolk sacs attached) stay in the gravel for two to three weeks and feed off their yolk sacs. 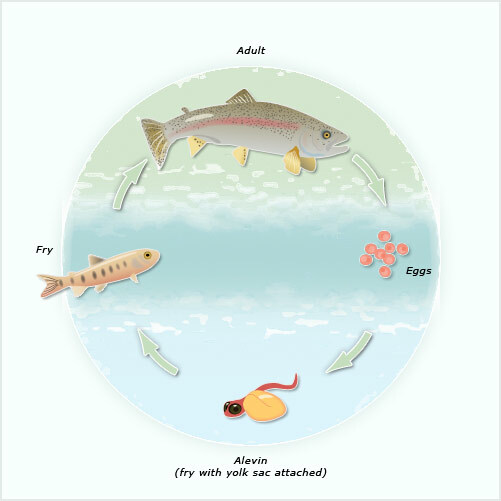 When the yolks are nearly used up, the young trout emerge as free-swimming fry.